Mr. John William Griffin of Evergreen passed away Sunday, March 24, 2019. He was 95. 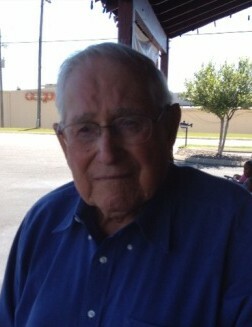 Mr. Griffin owned and operated Griffin Service Station for more than 25 years. He was always willing to help anyone stranded on the interstate. Often in the middle of the night. He enjoyed anything to do with his cows whether it be feeding, bush hogging or cutting hay. Later in life, he enjoyed sitting under his gazebo watching traffic. A funeral service will be held at 11 a.m., Wednesday, March 27, 2019 at Cope Keahey Funeral Home with Rev. Mike Jones. Interment will follow in the Mt. Pleasant Cemetery. The family will receive friends from 6-8 p.m., Tuesday, March 26, 2019 at Cope Keahey Funeral Home. Survivors include daughters, Johnnye Fay Miller of Evergreen, Rachel Tyner of Pensacola; son, Jimmy (Inez) Booker of California; grandchildren, Evan (Charity) Miller, Chad (Julie) Miller, Jason (Tina) Miller, Kristy (Luis) Blanco, Jon (Angie) Tyner, Justin (Christi) Tyner, Joanna (James) Smith; 17 great-grandchildren. Mr. Griffin is preceded in death by his loving wife of 68 years, Faye Smith Griffin; daughter, Debra Griffin Booker; parents, Rufus and Roxie Griffin; sisters, Lois Riley, Emma Dearmon, Corine Pipkins; brothers, William Griffin and Bill Griffin. The family would like to recognize caregivers Ann Till, Tina Miller, Dorothy Morris and Helen Whitman.